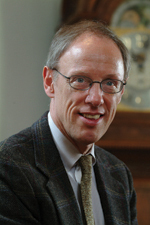 Thomas R. Tritton, formerly president of Haverford College, will become president of the Chemical Heritage Foundation (CHF) effective 1 January 2008. He will be only the second president of CHF, succeeding Arnold Thackray, who founded the organization in Philadelphia 25 years ago and will continue with CHF in the new role of chancellor. Tritton was selected following a worldwide search for someone with both scholarly and entrepreneurial talents, who combines a passion for the long sweep of chemistry and molecular sciences with the drive to build and sustain a successful enterprise.